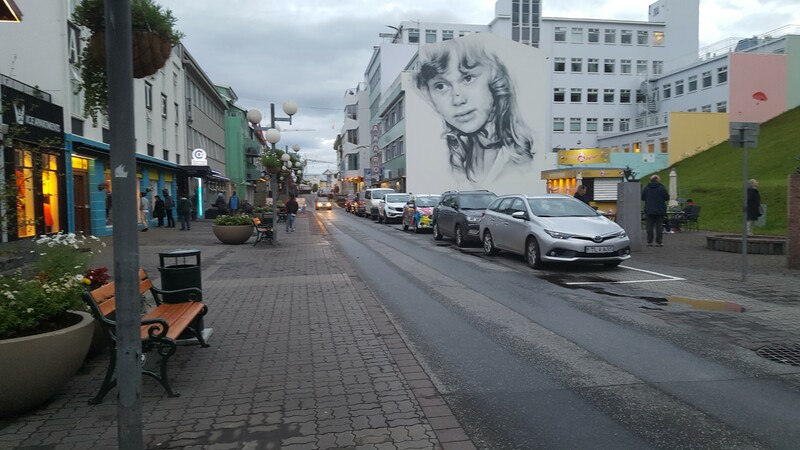 After sailing for a day, we arrived in Akureyri, reputed to be the nation’s loveliest town. It was about 10pm and we asked the ship’s receptionists if we could leave the ship. They did not know. However, when we went to our cabin we noticed people were leaving/returning to the ship. So we decided to have a quick look at the town and pubs. The time was 11.15pm but broad daylight. We left the ship and walked over the fjord towards the town. I took many photos because I couldn’t believe how light it was. The first pub was packed full of Icelandic hipsters sipping their beer. So we did likewise. The barman told us about the local beers, we flashed our credit card, and sat down. After enjoying a fine IPA we walked on and visited another packed bar and was cheerfully asked “Would you sit on our seats while we go for a smoke?” We did so, but they didn’t want their seats when they returned and we started chatting about Iceland. They told us Iceland gets dark for about 15 minutes in July, but, in the winter they have three hours of daylight and take vitamin D tablets! After this little chat, we returned to the boat as we had a trip around the local area. Must say, having sat drinking Cava in the ship pub and then going on this adventure, we were a little jaded the next day. We visited Namaskard which was an amazing experience. We saw many steaming fumeroles belching out sulphur from the springs below. Mudpots were bubbling away, can reach 100c/212f, and the lighter coloured parts of the surface crust can cave in easily. Sulphur was used here for hundreds of years for the manufacturers of gunpowder. 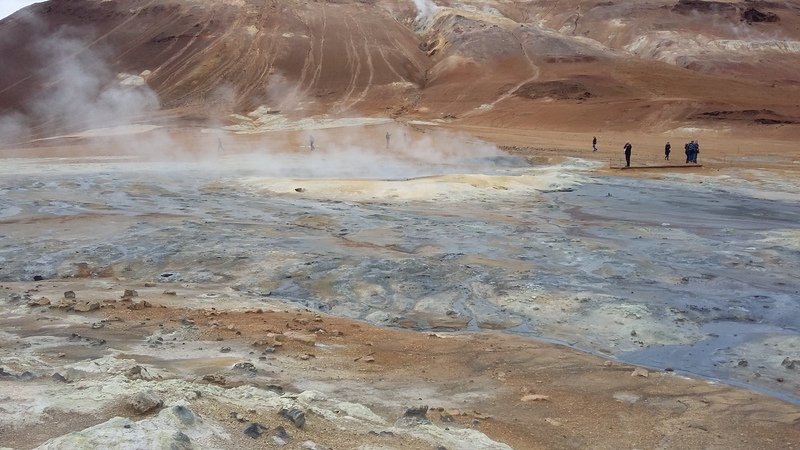 The whole place is a geothermal field and was the highlight of the tour. 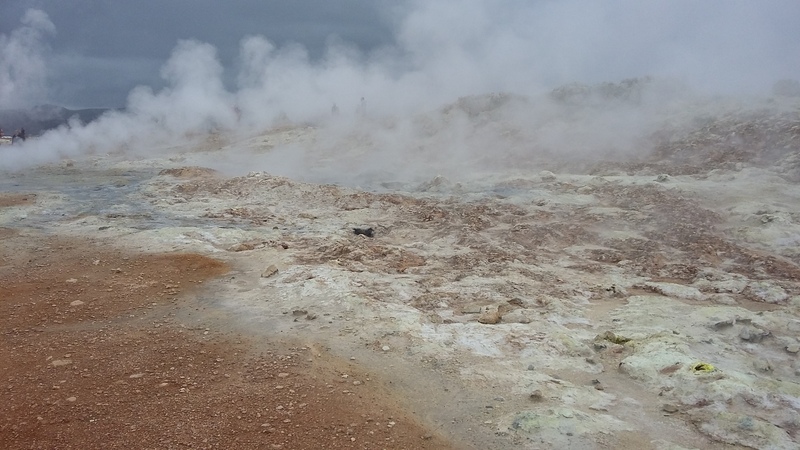 Quite incredible watching the mud pots, steam vents, sulphur deposits, boiling springs and fumaroles. 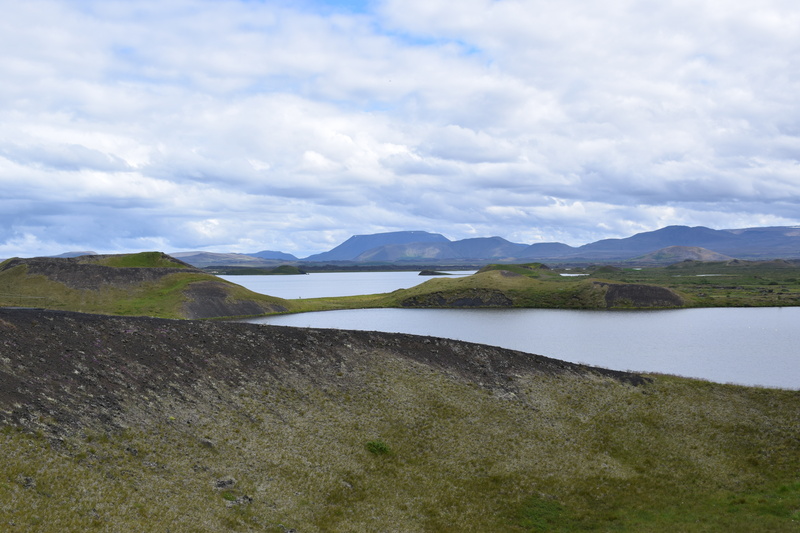 After this incredible spectacle, we proceeded to Lake Myvatn, which is a breeding area for ducks and tremendous geological interest and saw the craters at Skutustadir. The craters were formed when, during volcanic eruptions, the bogs were heated to extreme temperatures, causing the water in the bogs to turn into steam, and expand, thus causing explosions that pushed volcanic ash aside to leave the pseudo craters. or Dark Fortress, Nature Reserve. This is so we could view of magnificent lava landscape and its strange formations including pillars, arches and whatever you wish to see from the shapes of the lava which encouraged Icelandic folklore (trolls). 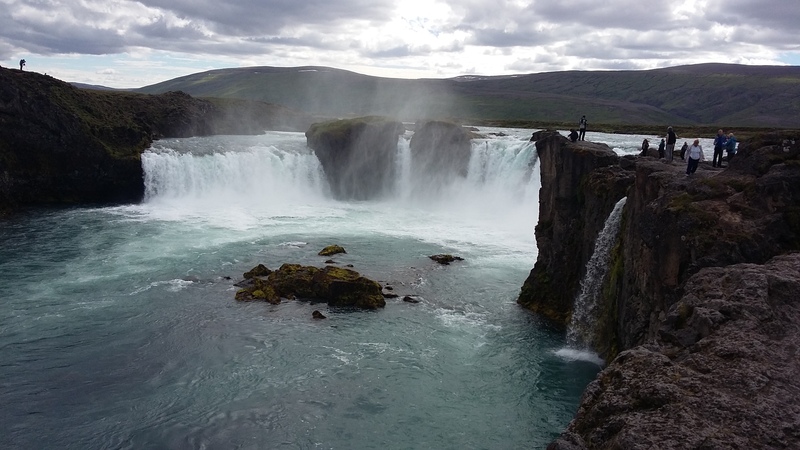 Then finally, we saw the Godafoss Waterfall – the waterfall of the Gods, which is a beautiful crescent of cascading water. A fantastic day viewing natural geological phenomenon that will never be forgotten and I am mighty glad I was able to experience the jewels of the North of Iceland. Highly recommended. We visited in July and the scenery was spectacular. Well worth a visit. Brought back some good memories, even if they were only from June! 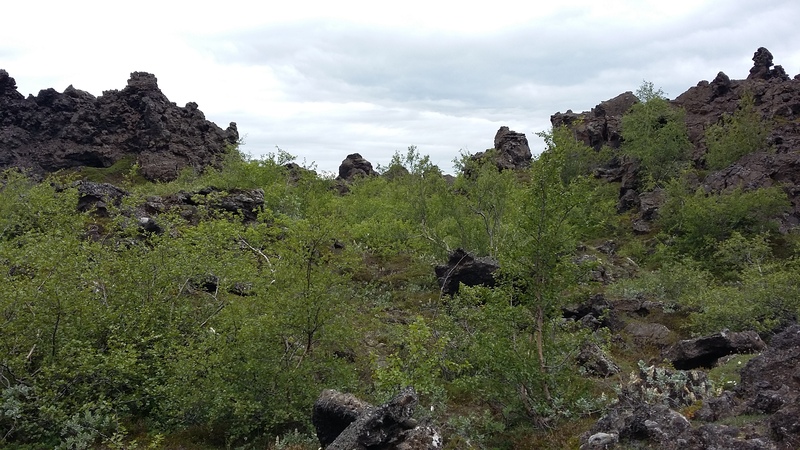 How were the midges at Skutustadir and Dimmuborgir? We saw lots of people wearing full head veils to avoid them! Oh you have reminded me of the full head veils! It wasnt too bad for us. Fantastic place Iceland and may go back.